Pianist, improviser, and composer Rafael Barrera just released his debut album called “Amser” – Welsh for “Time” – featuring Will Joy on a six-string bass, and James Edmunds on drums; all mentored by some of the most influential jazz musicians in the UK such as Huw Warren, Paula Gardiner, and Martin France. 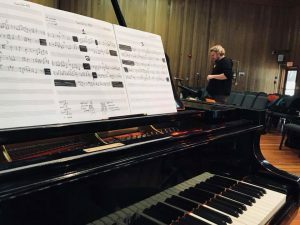 The all-original album, recorded in The Atrium and engineered by Adrián Strozzi, projects six pieces that go from a wide variety of rhythms and compositional styles that bring out Rafael’s constant search for individualism and originality in the music. The band is formed by Rafael Barrera, leader of the project; despite being born in Mexico City, he has lived in Mexico, Los Angeles, and most recently Cardiff, where he studies at the Royal Welsh College of Music and Drama. James Edmunds, who by the age of 19 already has a number of credits to his name in London and New York. And Will Joy, whose experience in playing in a number of music setups got him a place at the Guildhall School of Music. Amser has landed in the spotlight in the US, Mexico, Europe, and the UK, garnering critical acclaim from outlets such as Buzz Magazine, Jazz In Europe Magazine, KRTU FM and Horizonte Jazz. Often praised for his driving compositional style and contemporary sound, Rafael explores jazz in a unique imaginative way.